The great age of ocean navigation. After the host has poured water into the stone wash basin he opens the door of the tea garden's middle gateway. When the guests see him approaching the gate they rise together from the bench in the waiting arbour and go out towards the middle gateway, in order of their rank as guests, with the main guest leading. The host and guest greet each other silently while crouching. This is 'mukaetsuke'. After this the host opens just the latch of the gate and returns to the tea room. The guests go through the middle gate and wash their hands and rinse their mouths at the wash basin. Then they go on to the tea room. When the guests enter the tea room they first go to look at the hanging scroll in the tokonoma (alcove), then the hearth and the kettle and also the utensils displayed on the utensil shelf. Then they take their seated positions in order of their rank as guests, with the alcove as the highest ranking part of the room. So the main guest sits closest to the alcove. 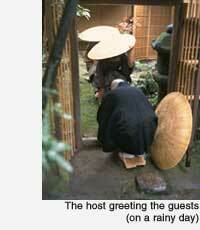 When the makkyaku (last guest) has entered the tea room he closes the door, making a slight noise. This tells the host that everyone has entered the tea room. When the guests are all in the tea room the host comes out and greets the guests, and finally does sumidemae (charcoal procedure). This is called shozumi (first charcoal procedure). Charcoal is added to the ro (hearth), incense is burned and the guests examine the incense burner. Next the host serves 'kaiseki' cuisine to the guests. Usually it consists of 'ichiju sansai', one soup dish, mukozuke or 'opposite side dish', nimono (boiled food) and yakimono (broiled food), so that the guests are served vegetables, fish and fowl. Recently more things are included in kaiseki cuisine, and it is common for cooked vegetables to be served and side dishes for sake, so that the guests entertained with both food and sake. When 'kaiseki' is finished, the host offers omogashi ('main sweets') to the guests. At a tea event, sweets are served in a five-tiered set of stacked boxes called a fuchidaka and each guest has a sweet pick called a kuromoji. Each guests takes sweets from the fuchidaka and puts them on the kaishi paper used for this purpose. When they have finished eating it is the end of the first part of the gathering (shoza). The guests go out of the tea room into the garden (usually the inner tea garden) and sit in the inner waiting arbour. This is called 'nakadachi' (the middle break). Copyright© 2005 Omotesenke Fushin'an Foundation. All Rights Reserved.